At this time of year there is a tendency to look backwards; to think back on all the year’s discoveries. So, it comes as a bit of a shock to stumble across one of the best things I’ve heard all year. The Moorings by New Orleans singer songwriter Andrew Duhon came at me out of nowhere. Duhon is a new name to me. He may be a new name to you too but he won’t be a new name for long. If the songs on this album are anything to go by, Andrew Duhon will be a big name before long. The Moorings is rooted in folk music but is no way stuck in the past. The opening title track echoes an old Scottish tune “The Bonnie Bonnie Banks O’ Loch Lomond” but Duhon sets it to a shuffling rhythm and sends it sailing. And the lyrics also deal with sailing away; from the refuge of love to whatever unknowns lie ahead. Songwriters strive to find new ways to tell old tales and only the best succeed. 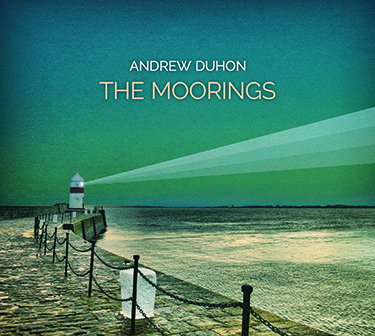 The songs on The Moorings may deal with familiar themes: love found and love lost, mistakes made and lessons learned; shared joys and solitary sorrows but Duhon brings the craft of a master short story writer to his songs and in doing so creates a series of skilfully rendered vignettes. Does he find the devil in “Evelyn” as he tries to recreate the Garden Of Eden or is it a song of salvation? Duhon leaves you to decide. A sure sign of quality song writing is that on first hearing the song sounds like you’ve known it all your life. “Tandem Bike” and “Feel It In My Soul” are as familiar as old friends. Maxwell Zemanovic – drums and percussion; Myles Weeks- upright and electric Bass; Jon Harris – lap steel; Adam Campagna – piano, keyboards, accordion; Eric Heigle – drums (“Takes a Little Rain”); Trina Shoemaker – Percussion; Chris Lippincott – pedal steel; Jack Craft – Cello; Sam Craft – Violin; Michael Girardot – Trumpet; Kara Grainger and Lisa Mills – harmonies. These musicians play in the service of the songs and get it just right. Kudos too to Grammy Award winning producer Trina Shoemaker who brings a warm, open sound to the album. These are songs that you will want to hear again and again. I suspect that Andrew Duhon will be singing these songs, and those still to come, to audiences for a very long time and that other singers will want to sing them too – I can hear Bonnie Raitt singing “Sidestep Your Grave” in my head right now. As I listened to The Moorings names like John Prine, Peter Case, Ray Lamontagne and Steve Earl came to mind, not because Duhon sounds like any of these guys but because he can stand shoulder to shoulder with them as a songwriter. Give The Moorings a listen, you won’t regret it. The Moorings is available from andrewduhon.com or from Itunes, Rhapsody, Napster and Amazon MP3. This entry was posted in Miscellanious and tagged Andrew Duhon, CD, John Scott, Music, The Moorings. Bookmark the permalink.